Working with the follow models:WD-60735 WD-60737 WD-60C8 WD-65735 WD-65837 WD-65C8 WD-73736 WD-73737 WD-73835 WD-73837 WD-73C8 WD-73C9 WD-82737 WD-82837 WD-56737 WD-60C9 WD-65736 WD-65835 WD-65C9 WD-73735 WD60735 WD60737 WD60C8 WD65735 WD65837 WD65C8 WD73736 WD73737 WD73835 WD73837 WD73C8 WD73C9 WD82737 WD82837 WD56737 WD60C9 WD65736 WD65835 WD65C9 WD73735 TV. It is helpful to protect the lamp. Power switching interval should be about 5 minutes.First, turn on the power and then continue to press and hold the lamp lamp until the green light does not flash. 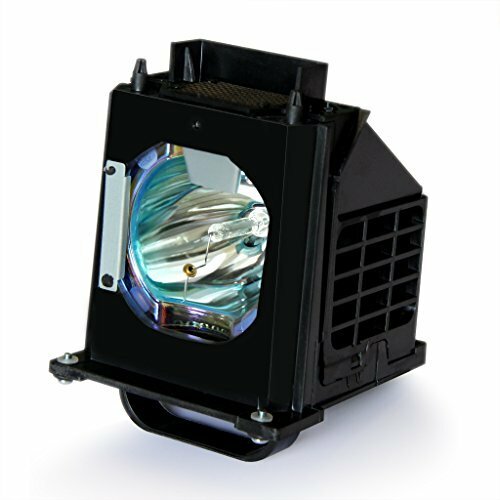 Secondly continue to hold down the lamp until the green light does not flash, the projector cooling fan stops rotating, and finally cut off the power. Some problems you may have. Q: Item does not match the TV/Projector? A: Incorrect installation ,turn and try another please. Q: The project bulb not work after installation? Q: Dose this lamp will work as same as the original one? A：To be honest, not. Because of the different price. But it will work at least 2000 hours, If it can't last more than 3 months. Contact us, we will replace you a new one. Q:The screen color looks different and the light shakes after the correct installation? A: The TV/Project DMD chip and color film problems. Working with the follow models：WD-60735 WD-60737 WD-60C8 WD-65735 WD-65837 WD-65C8 WD-73736 WD-73737 WD-73835 WD-73837 WD-73C8 WD-73C9 WD-82737 WD-82837 WD-56737 WD-60C9 WD-65736 WD-65835 WD-65C9 WD-73735 WD60735 WD60737 WD60C8 WD65735 WD65837 WD65C8 WD73736 WD73737 WD73835 WD73837 WD73C8 WD73C9 WD82737 WD82837 WD56737 WD60C9 WD65736 WD65835 WD65C9 WD73735 TV. If you have any questions about this product by CHANGSHENG, contact us by completing and submitting the form below. If you are looking for a specif part number, please include it with your message.